Please note Uncover Squirrel Hill Valentine's Day Weekend Wine Walk occurred in past. 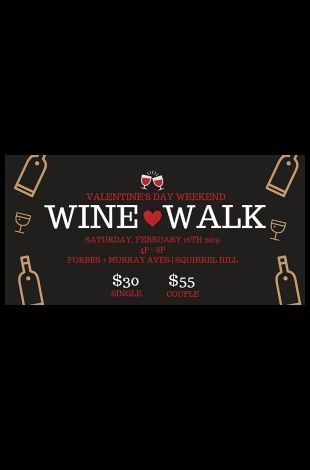 Join Uncover Squirrel Hill for premier Valentine's Day Weekend Wine Walk: self-paced wine tasting experience. 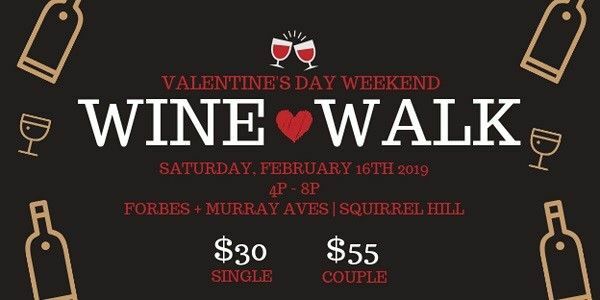 The Valentine's Weekend Wine Walk will take place in the Squirrel Hill Business District located on Forbes and Murray Aves in the heart of Squirrel Hill. Due to limited ticketing, advance ticket purchase is recommended. Participants will be required to check in, show valid ID and receive their wristband the day of the event. Must be 21 or older to participate. Uncover Squirrel Hill encourages you to drink responsibly.